Too Many Tomatoes? Ain’t No Such Thing! We’ve certainly been lucky this year with the weather. Tomorrow is the last day of September and amazingly, there is still basil growing in my garden and my pepper plants are laden with big, crispy fruit. Still, no two ways about it: when October begins summer is well and truly over. 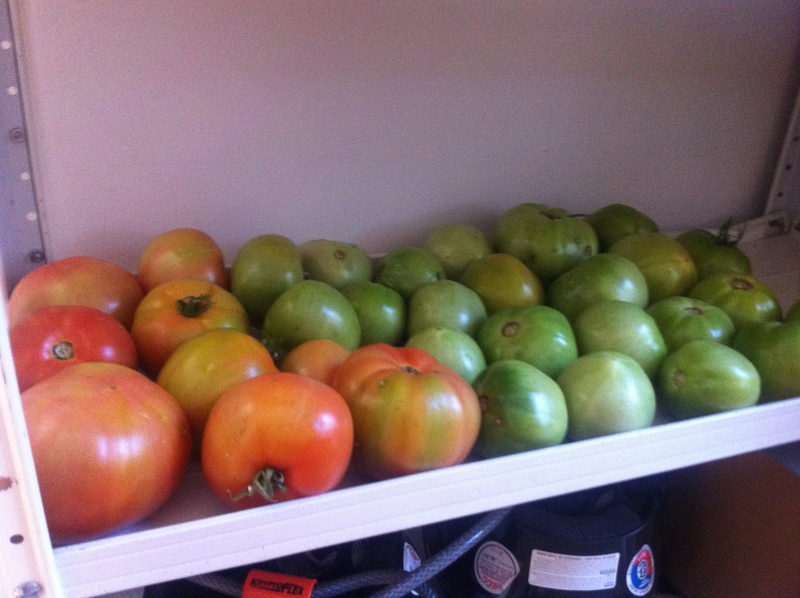 What to do with all the green tomatoes? Let me share my own favorite way of preserving the summer in the cold months. Notice that they are at various stages of ripeness. Whenever there’s a batch (maybe twice as many as are red-ish in this picture) ready to go, I cut a small X in the blossom (ie bottom) end of the fruits and put them directly into a large pot of boiling water about three at a time. Let them boil for a few seconds (20 or 30 is usually enough, but they may take longer) until you see the skin start to split all the way around. Then, take them out and plunge them into cold water and put in the next batch. This process is called “blanching” and is used to deactivate enzymes when processing a lot of foods for preservation. In this case, though, you mostly just want to make it easier to remove the skin. Next, take a sip of your wine (forgot to mention that – this process goes marvellously well with a full-bodied red) and begin to peel and core the tomatoes. Just grab them one by one and the skin should slip right off. Take a sharp paring knife and take out the core, and if you’re fussy, cut the tomato in half and scoop out the seeds and juice. I sometimes do this for extra finesse if I’m making soup, but it’s not completely necessary. Then, just cut the tomatoes roughly into quarters. 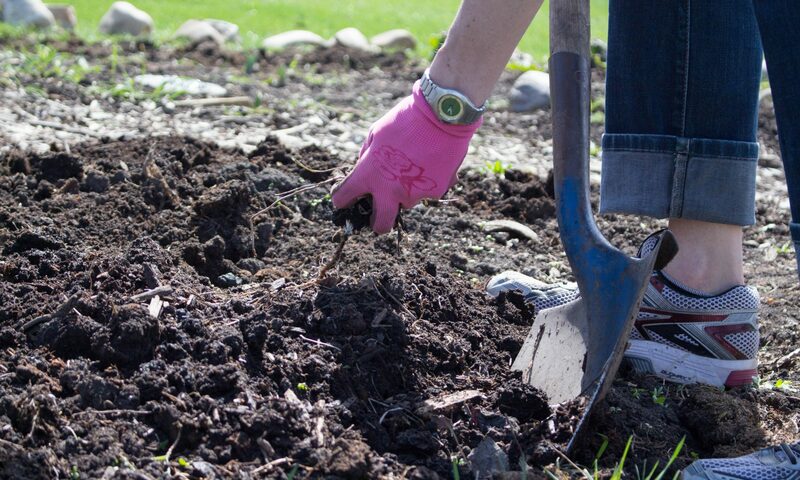 Don’t forget to put the cores, skins, and juice into your compost. Your garden will make them into more tomatoes next year! Now, my favorite part: Turn the heat on medium high and stir gently once in a while until they start to simmer. 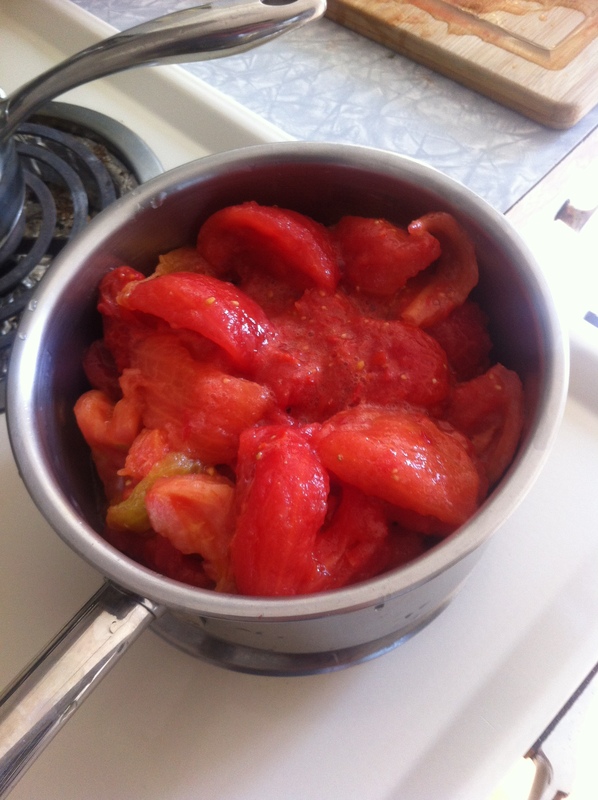 This will make your house smell awesome, but will also reduce the tomatoes into pulp. How long you cook them depends on what you plan to do with them. 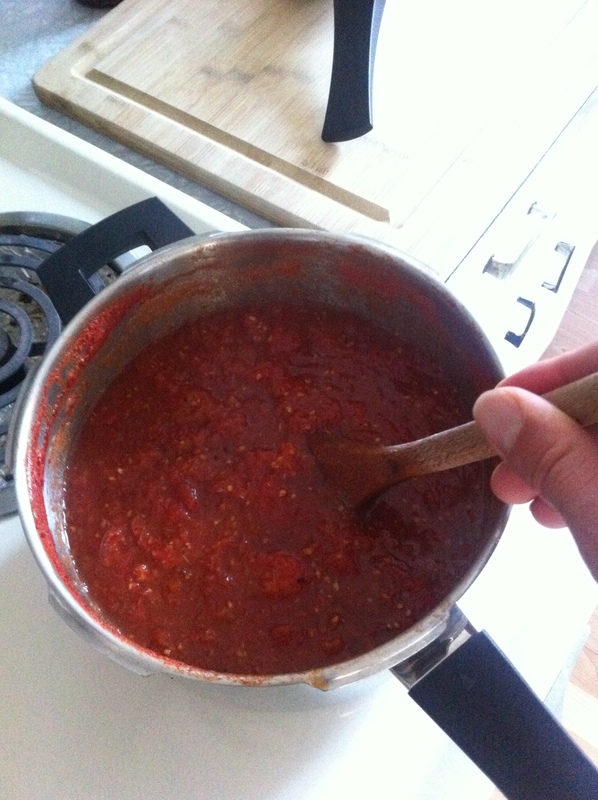 If you want to make tomato soup (I recommend gazpacho) then simmer until they are mushed and leave it at that. Usually, though, I let them simmer for half an hour to an hour until they are reduced in volume a bit. At this stage, I put the paste into small ziplock bags and freeze them without adding anything else, because I like the versatility – you can use it for Indian curries, pizza sauce, soup, or salsa. However, if you know you are making pasta sauce, for example, you might want to add parsley, oregano, garlic, and thyme while they simmer. 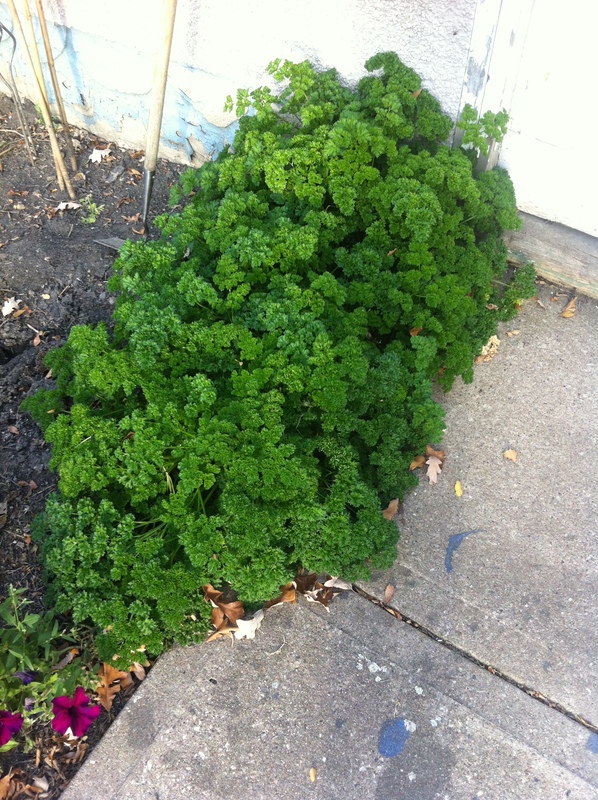 Speaking of parsley, does anybody want any of mine? I have a LOT! Hello Diggers. Isn’t our garden lovely? This is our kale patch. 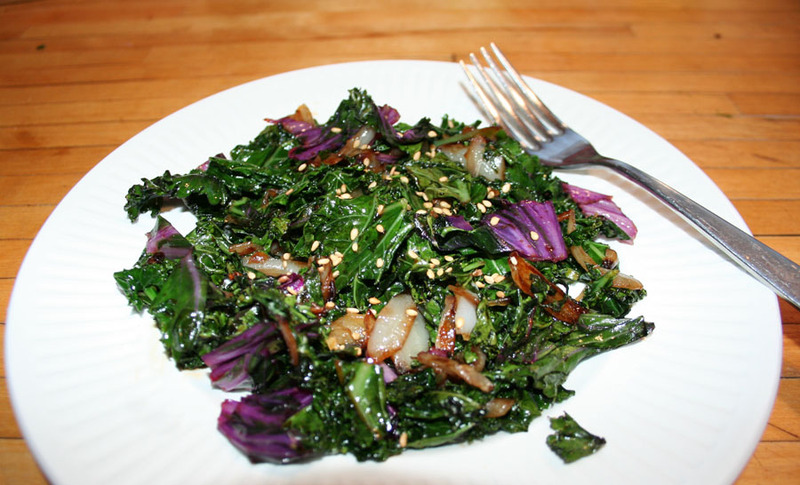 In case you’re a bit shy of it, let me tell you what I do with kale. Step 1 is to snap off a dozen or so leaves. You don’t want the baby ones at the top, but the middle-ish ones that are fresh looking. I took a dozen leaves plus a little red pepper and I doubt you could tell I was there. 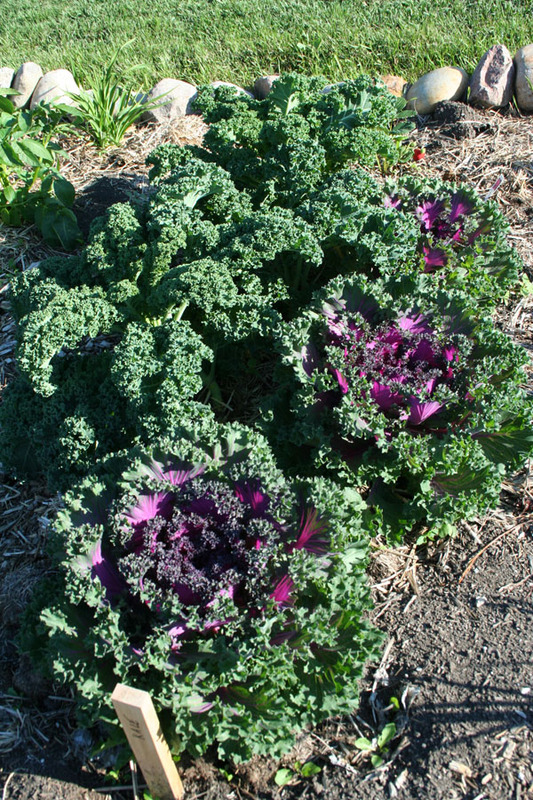 There are two kinds of kale in our patch. One is a curly-leaf variety that is prized for it’s tastiness. The other kind is an ornamental variety. 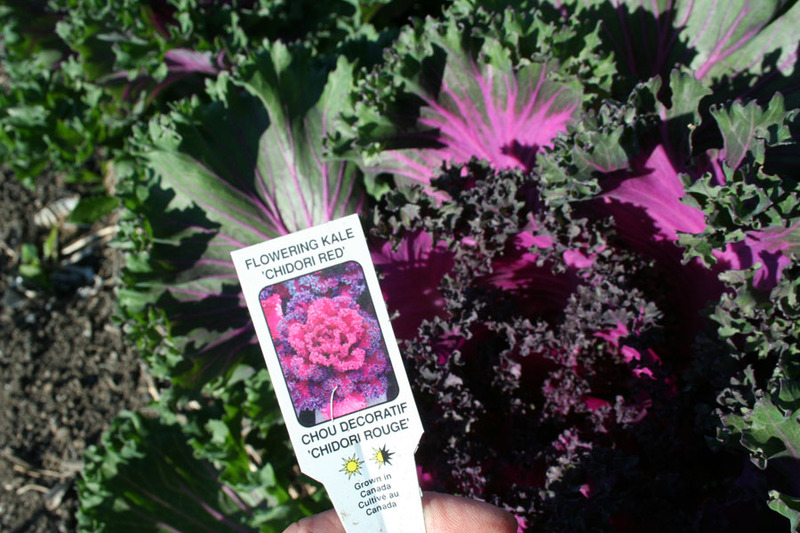 The purple flowering variety is entirely edible (all kale varieties are) but prized for it’s showy colours, not for it’s flavor. I didn’t notice a big difference in taste this early in the season. Take some home, wash it, and remove the spines. Toss them in your compost bucket. You want the leafy bits. Kale freezes amazingly well so I like to stock up for the winter months. 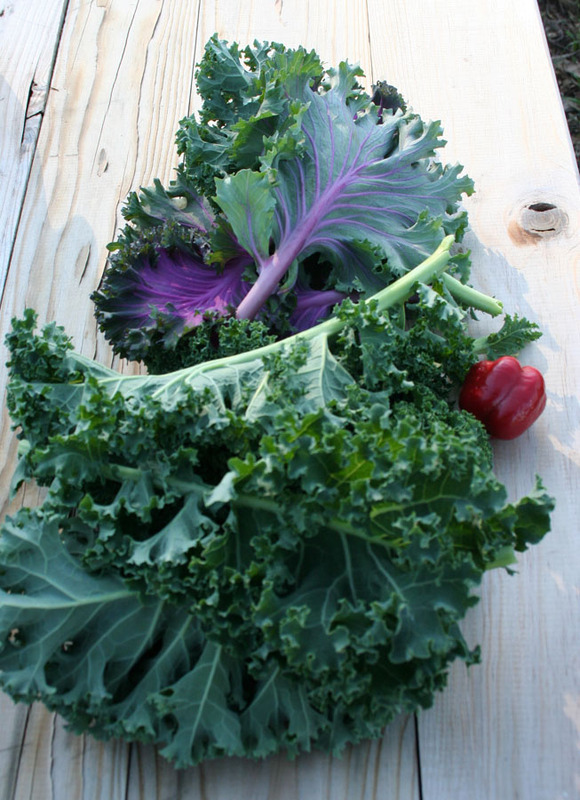 Kale is one crop that gets a bit sweeter with freezing and it holds it’s structure marvelously (more like cabbage then spinach) in soups, stews, sauces, chili, etc. so it’s wonderful to have a freezer full. 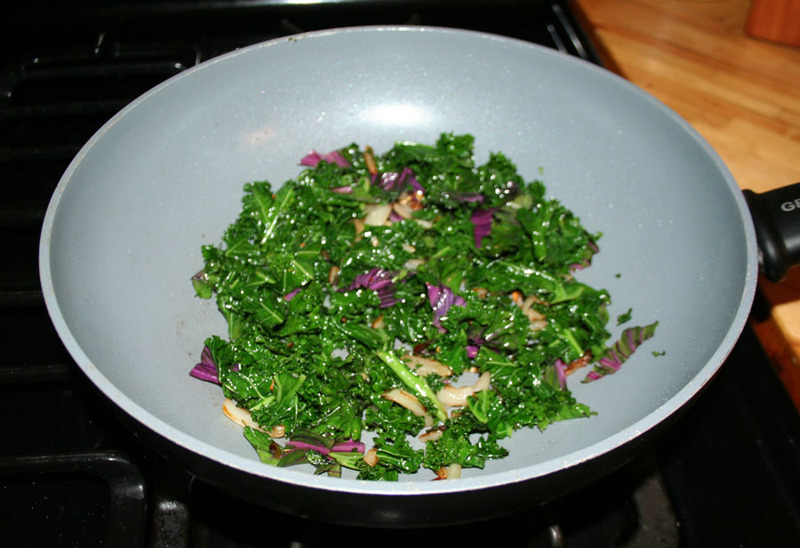 In the winter when you’re cooking savoury dishes, add a few leaves of frozen kale. I don’t bother chopping them before freezing, I just crumple them into the pot. But do remove the spines. 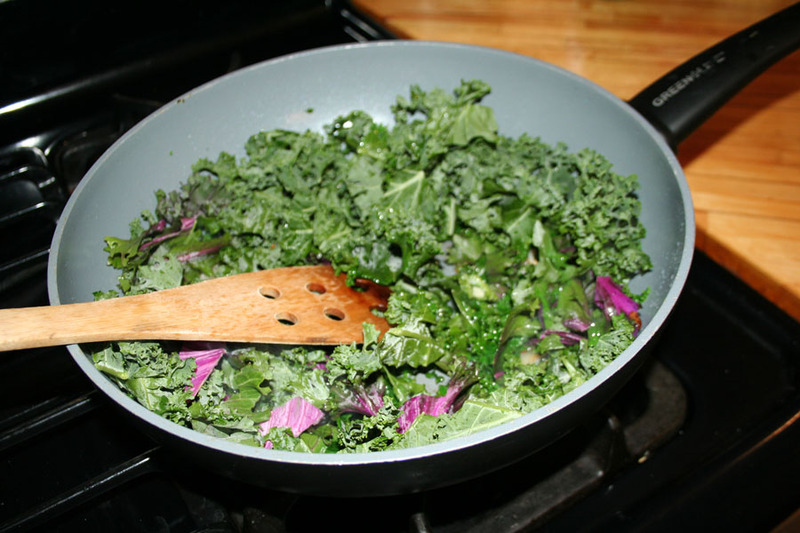 Kale adds so much green nutrition to winter foods. I froze about half of the leaves I picked. I made a simple stir-fry side-dish out of the rest. My friend Audrey, a nutritionist and a rare beauty taught us this technique for cooking up any greens (bok choy, spinach, gai lan, what have you.) 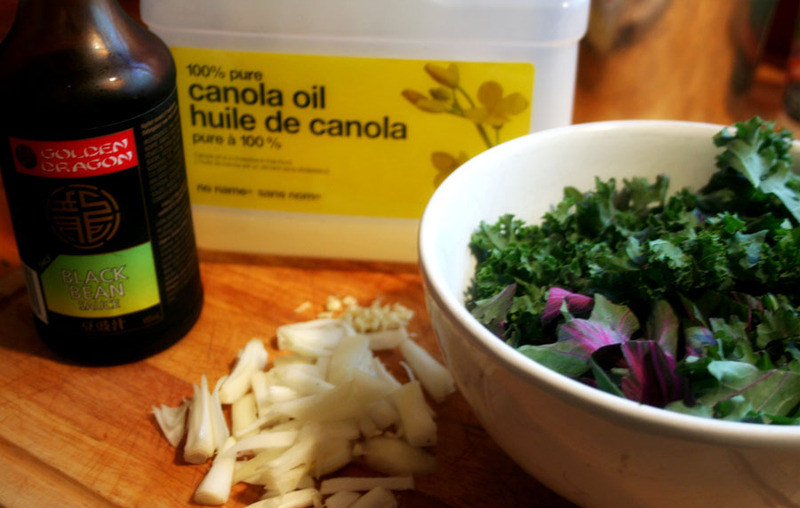 It works great for kale. 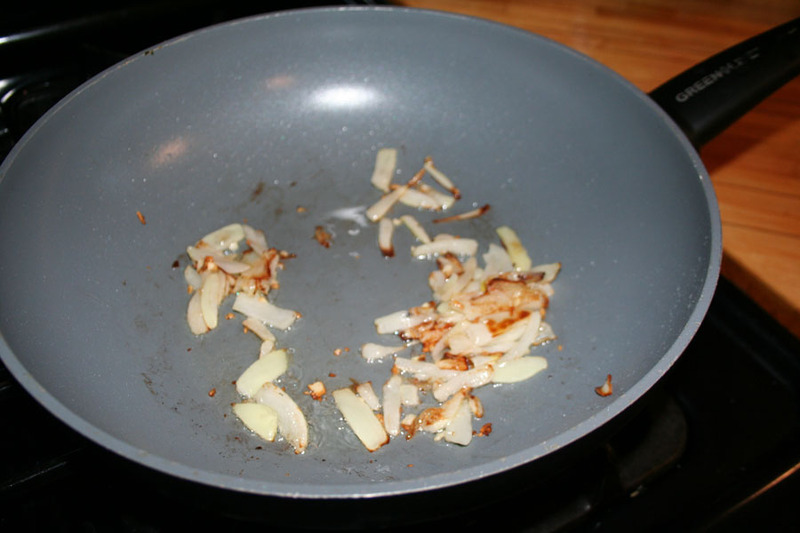 Sizzle the onions and garlic in a wok or frying pan. 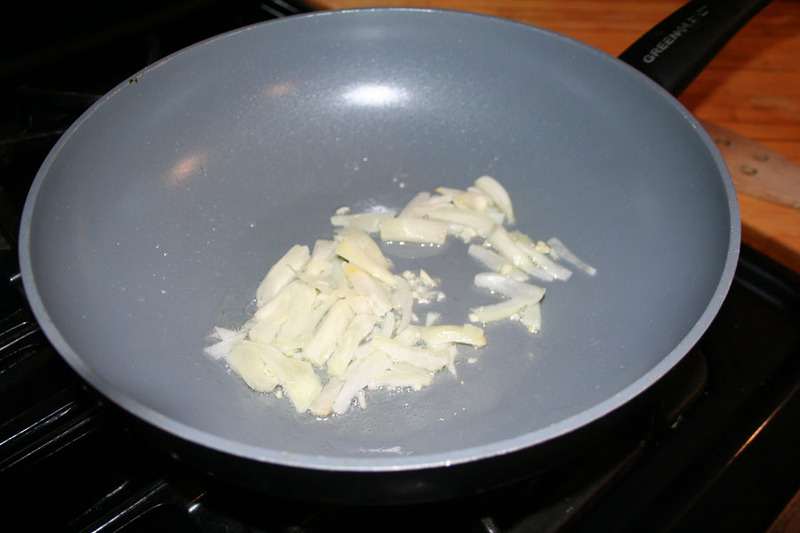 You need lots of room for greens in your pan, so you need a pan with enough volume. 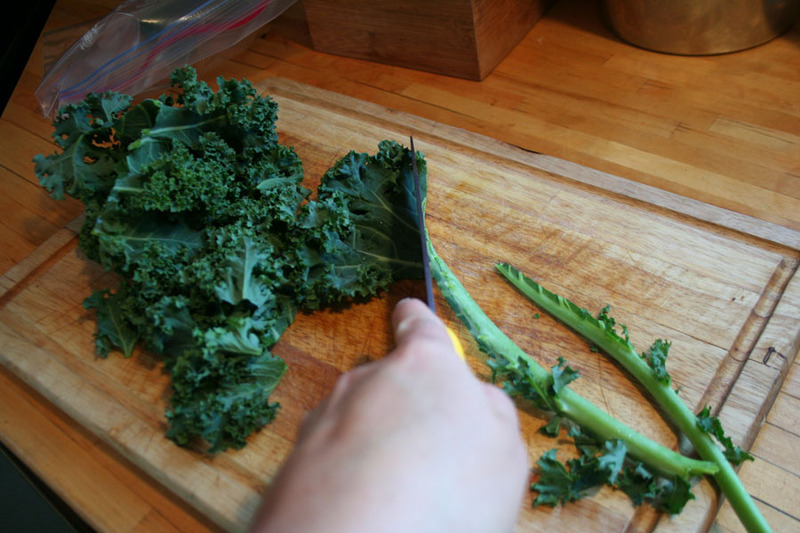 Add the kale and toss it around. Fry it until the greens are wilted, but still bright. 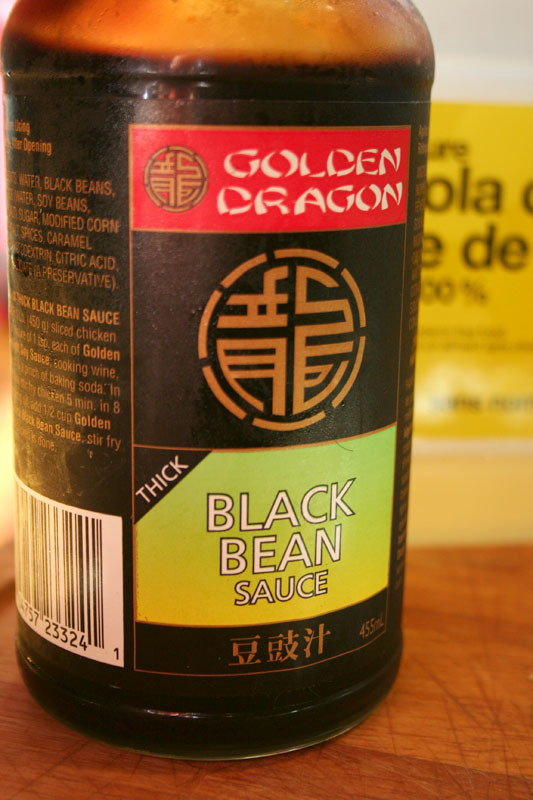 Add a wee slorp of black bean sauce. 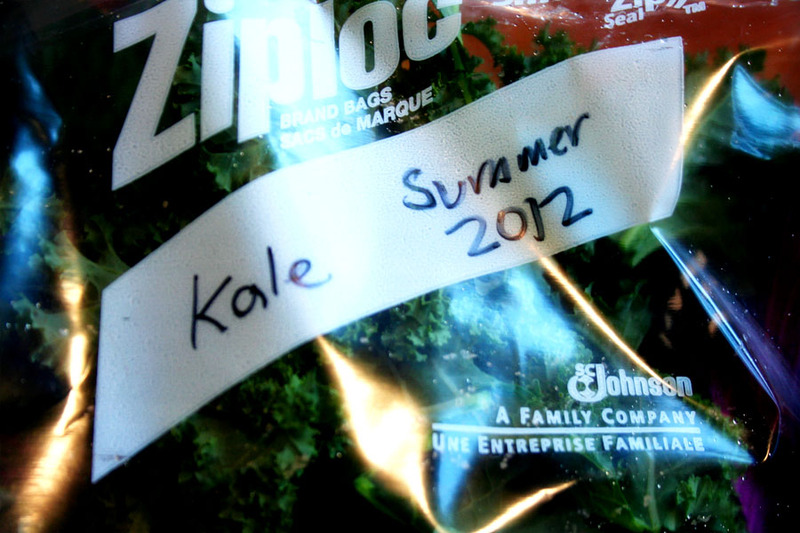 I used about about a tablespoon for six leaves of kale. It’s very salty, so don’t add too much. Use a little, taste it, then add more if needed. Fast. Easy. So nutritious. 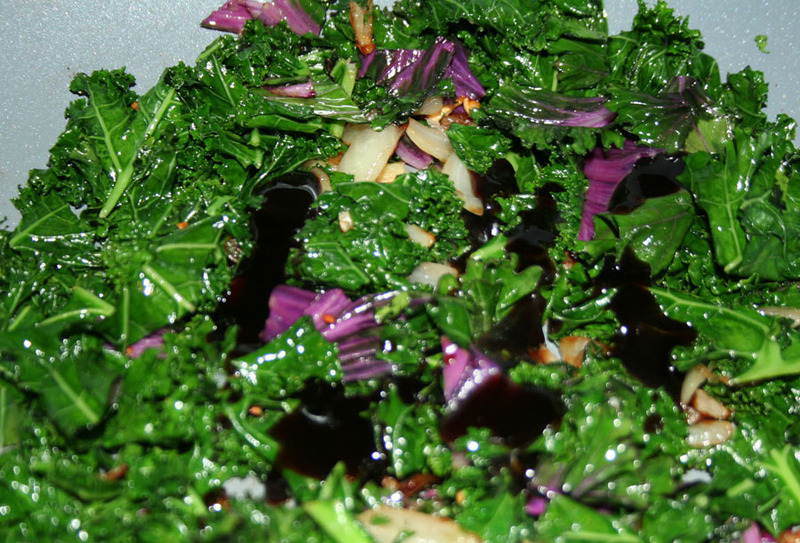 Kale yum yums. 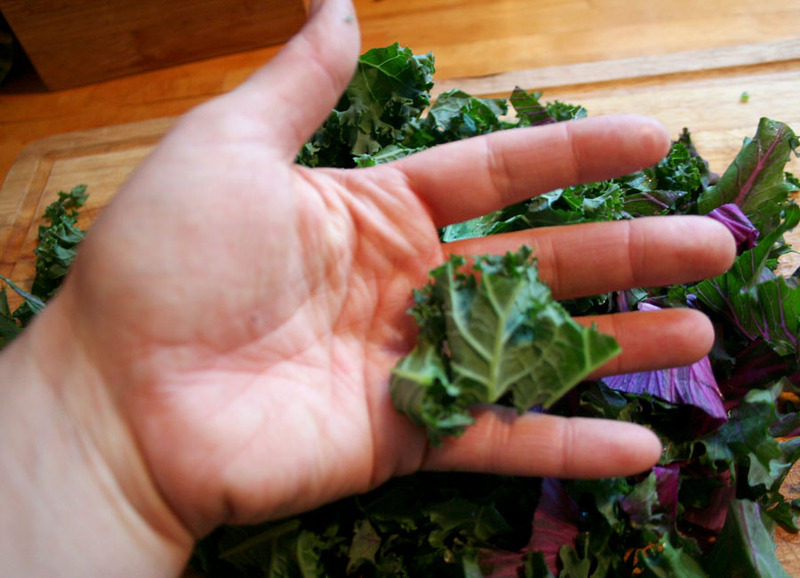 According to Organic Authority, Kale is the New Beef. 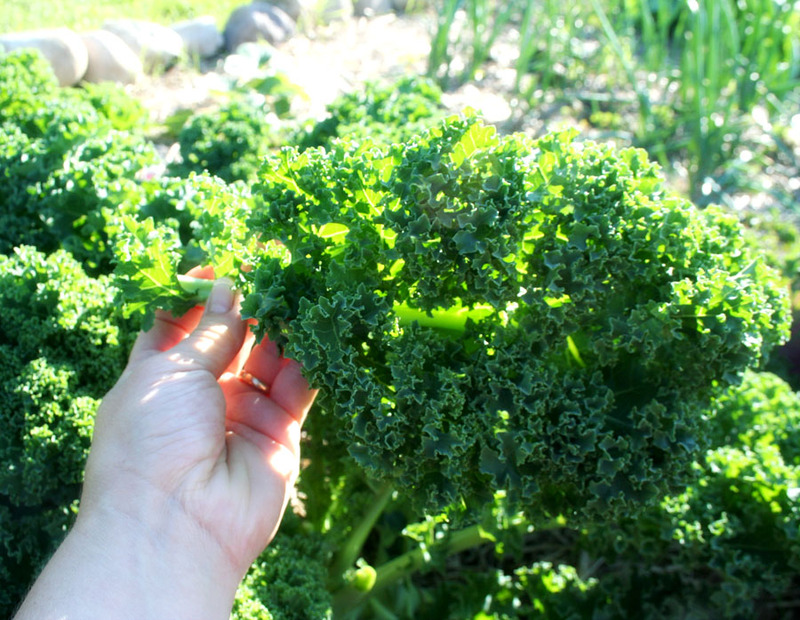 Drop by the Parkallen Community Garden anytime and help yourself to the kale.